As a farmer I have worn many hats, and I mean that both literally and figuratively. 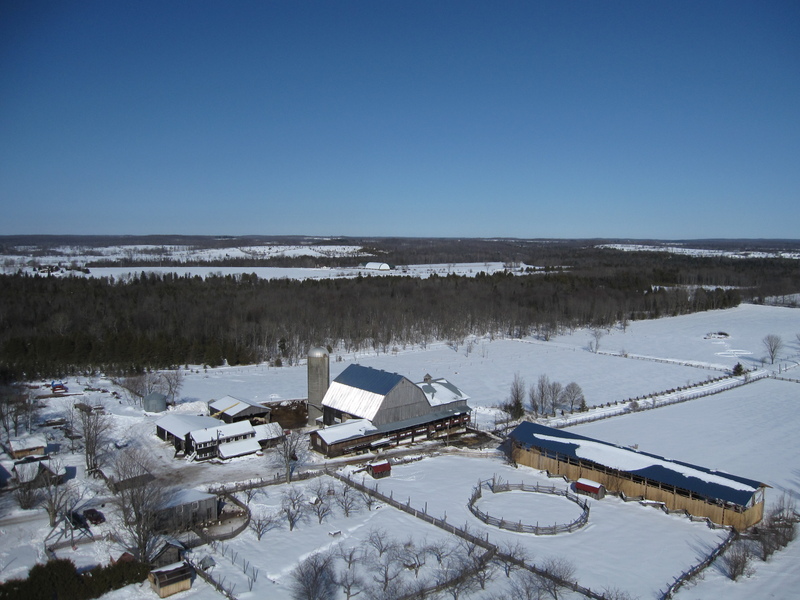 I have just returned from a three month stay at Glencolton Farms, the home and farm of Michael Schmidt, a prominent figure in the national and North American raw milk debate. My intention for heading up there was to learn about dairy farming. As with most intentions, when it came to reality I had no idea what to expect. Except maybe early mornings, everybody knows dairy farmers get up early. I never thought I could get used to getting up at 4:40am every morning, every week, every month…but I did. 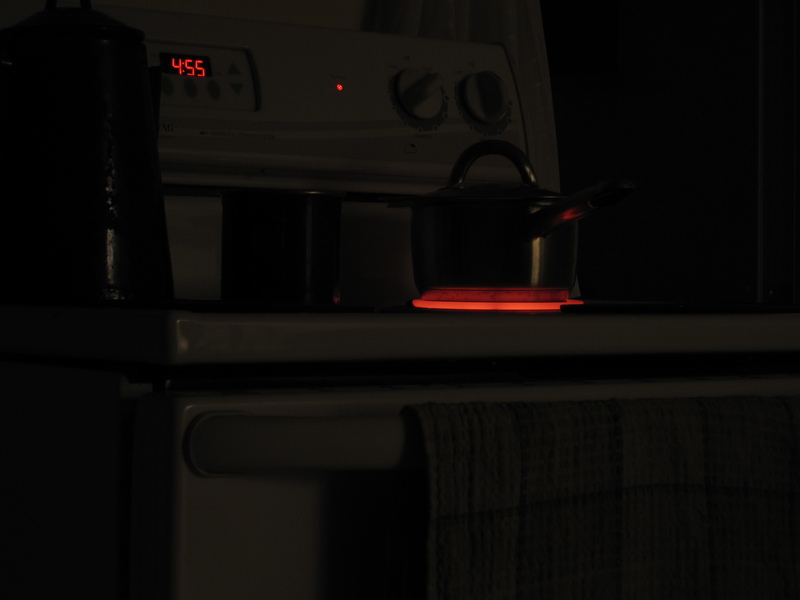 Pictured here is our kitchen stove with some water boiling for the morning tea that Markus and I make. Our usual selection is stinging nettle tea, though we occasionally throw in some variation with sage, rose hip and pepper mint, all harvested from the farm. While the tea helped with the pre-five-am mornings, in the end no matter what time I went to bed 4:40 still feels normal, even on Sundays. From five to eight in the morning the barn crew caters to the needs and whims of our cows. Olga needs a bit more straw in her bed since she is a messy cow, Liova likes a good scratch at the base of her horns before I sweep, and Lola always goes first into the parlor. The barn is set up in what is called “tie stall and gutter” configuration, this means that the cows that are being milked are chained to their stall where they are fed. The cows have plenty of space to move and lie down and they have four hours each day to be outside in the barn yard, but the rest of the day they are held in their tie stalls. One of the first things we do when we get down to the barn in the morning is turn on the a mechanical gutter that we turn on twice a day to push out the manure and straw mix to the barn yard. Next the cows get their mineral supplements to keep body and digestive systems in balance. Most farmers would give their cows a calculated formula of nutrient supplements that they buy from their local supplier. Not at Glencolton. 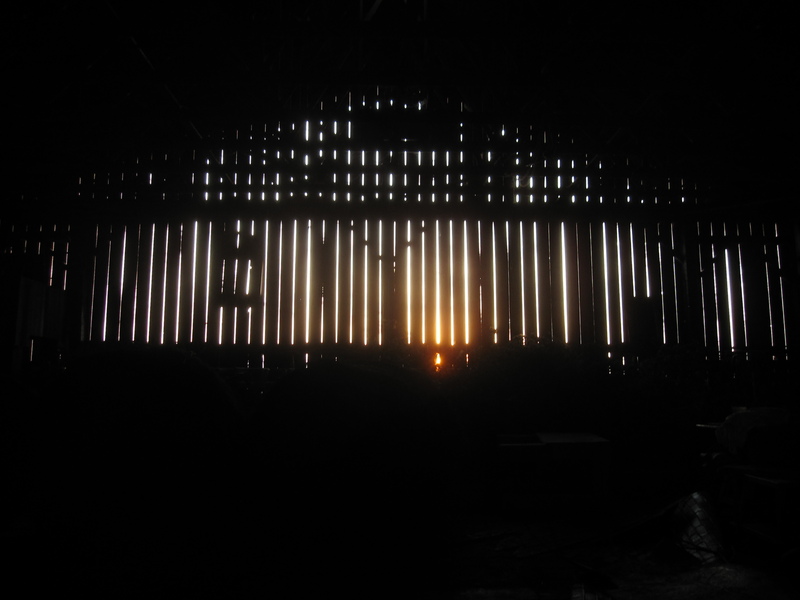 Here farm philosophies are the subject of many barn debates. And yet while any aspect of farm philosophy is open to rigorous philosophical inquiry generally the farm a biodynamic farm, based on the teachings of Rudolf Steiner. So instead of buying nutrients from somewhere else, we give the cows finely ground tree trimmings from the fence lines of the pastures. The trees, having deep roots and long lives pull a huge variety of trace elements and minerals from the ground and their leaves and twigs are an excellent sources of vitamins and minerals for the cows, and all occur naturally on the farm. Hat #1: La boina. Is a traditional hat of Spain, and similar in style to many traditional caps all over Europe. I wear a boina in honor of the time I have spent in Spain and the way it has shaped who I am. 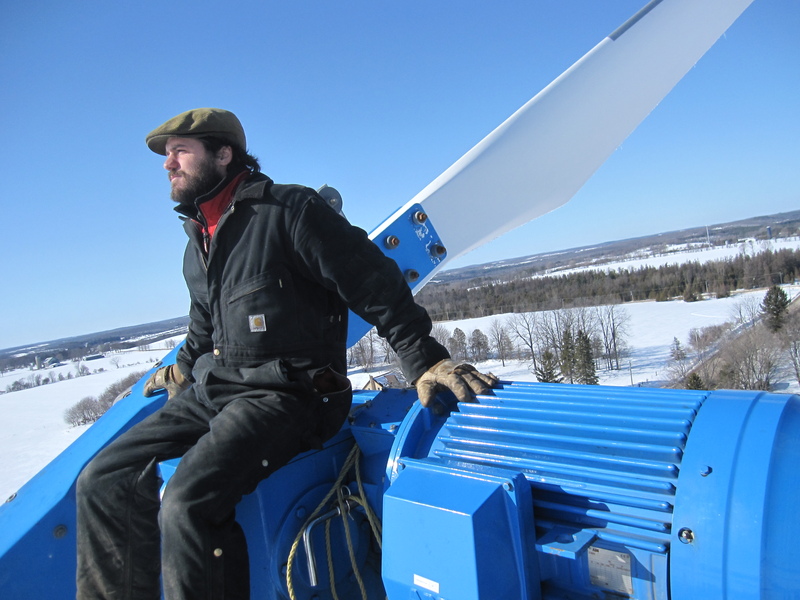 I wear the boina as an all purpose hat; in the barn, working out in the yard, or even climbing windmills. Glencolton has a forty meter wind turbine, which has been acting up, so Markus and I climbed up to investigate and take some pictures of the area on this beautiful sunny February day. Hat #2: The hair-net. Usually after barn and breakfast I head down to the cheese house. The cheese house is located right next to the milking parlor and the milk comes in from the parlor after the cows are milked and is stored in a bulk tank, which you can see behind us. The cheese house must be kept extremely clean, that means when I first step inside the entrance-way and before going through the plastic curtain, I change my boots, my shirt, put on an apron, a hair net and the quintessential beard net (which is terribly uncomfortable I would like to add). 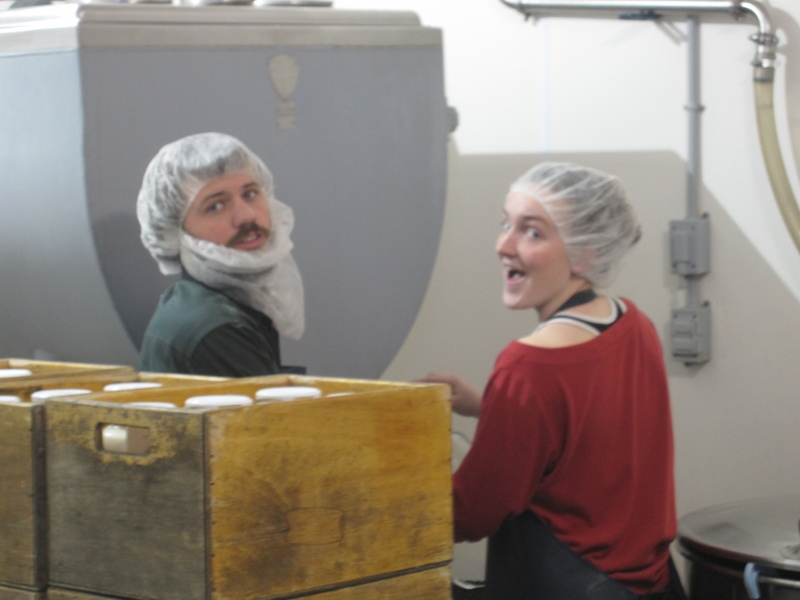 Here Felicity and I are bottling milk, we bottle the raw milk into one and two liter bottles that have been sterilized in our industrial dishwasher. The bottles are stored in the walk in cooler in those wooden boxes you can see. We are in the process of bottling about 720 liters, or about 190 gallons of milk. Other weekly activities in the cheese house include: making cheese, quark, cultured milk and lots of dish washing. We make many different types of cheese, though the selection varies from week to week, mostly we make soft cheese, Mountain Swiss basement cured cheese, Feta cheese, Camembert and quark. Quark is a soft spreadable cheese, similar to cream cheese, but it has more cultured tang to it. We also make a low temperature yogurt that we call culture milk. Milk used for yogurt is usually heated to 180 F (milk is usually pasteurized at 161 F) and then the culture is added and it is incubated at roughly 110 F for six to eight hours. Our culture milk is kept raw, the culture is added to the warm milk after milking, then it is bottled and put in a baking proofer which is set to approximately 125 F. It cultures there for almost 24 hours. Because of the lower temperatures the culture milk keeps the qualities of raw milk and is much less acidic than conventional yogurt. Hat #3: Bakers toque. I love to bake almost as much as I love to eat what I bake. Baking at Glencolton brings to light just how much we humans rely on grass. Grain is after all an annual grass. We took bags of our Red Fife Wheat, Spring Wheat and Spelt and put them through the mill that is behind me. It is a horizontal stone mill, which was purchased for his first farm in Germany. It will grind about fifty pounds of whole grain flour in an hour. The next step in our bread is to mix up a sponge with Michael’s sour dough starter and let that sit for a day. Next we mix up the dough and cold rise it over night, then the next morning we are ready to bake. And what marvelous bread it is, and the only imported ingredient is salt. 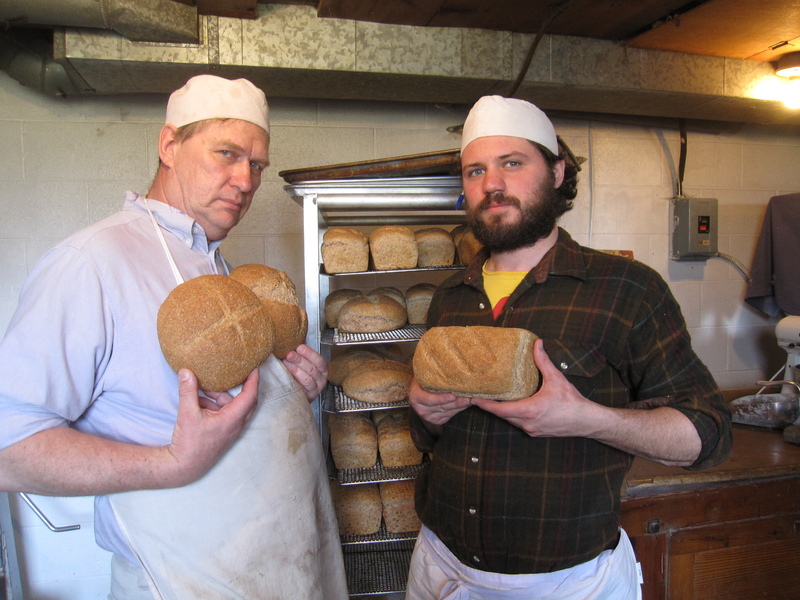 Somewhere in during this day, amidst conversations with Michael in the bakery, baking bread morphed from food product with a recipe to a philosophy: to make bread you must understand the bread. And understanding how flour of a certain grain reacts with water, time, temperature, yeast, and the air. One must understand how the texture of bread is shaped by our hands, the heat of the oven, the material of the oven, the humidity, and the variables go on. But my search for understanding makes the impossible goal of conquering those external factors an exciting philosophy. I learned to work with the bread. In wearing these different hats; in taking on different roles in producing food I cannot help but re-evaluate how I consider food. Even as a diversified farmer there were still simple foods whose processes were undiscovered and foreign to me. They had been muddled and disguised by the way modern industrialization has taken the process of production from the local shop with clear glass windows for all to look in, and shoved it behind the stainless steel and concrete walls of government inspected facilities. Yet from atop that windmill I could see the entire production chain of my loaf of bread: the snow covered fields where the wheat is grown, the grain bin where it is stored and cured during the winter, the bakery where the grain is milled and turned into bread, and the kitchen where we spread butter from our milk on the bread and eat it to keep the whole thing going. Nathan, you’ve always been a (baby, kid) man of different hats and it’s great to see you wearing them. Your milking adventure was quite captivating to read. You write gud — in addition to every other talent you have. I look forward to future installments. Wish you provide some baked goods for your readers to share but, alas, virtual breadstuffs don’t translate through the computer. setting. To achieve any degree of success, you have to throw that “hobby” label out – it’s time to work.